On June 18, 1980, at 12:40 PM, Ventura County Sheriff’s Deputies responded to a report and found a young woman dead in the parking lot of Westlake High School. Evidence at the scene suggested that the victim may have been killed at another location and her body moved to the parking lot. An autopsy determined the victim died as a result of multiple stab wounds, but she had also been raped and strangled. 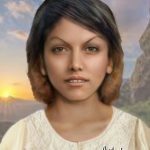 A forensic anthropologist determined the young female was Hispanic and/or Native American, age 15 – 25 years, 5 ft. 2in. tall, 110 – 115 lbs, brown eyes, and black shoulder length hair with bleached tips. She had extensive dental work and was 4 months pregnant with evidence of prior pregnancy(s). She wore white pullover short sleeve top, black bra, red corduroy pants, and black high heeled open toed shoes. An unsuccessful homicide investigation was initiated in 1980, and now investigators have reason to believe the victim may have been from either the San Fernando Valley or Kern County. In 2015, DNA results from scrapings of Venture Jane Doe’s fingernails and clothing linked her and another woman discovered in Kern County to Wilson Chouest, a 63-year-old, who was already in prison but didn’t know his victims. On May 31, 2018, a jury found Chouest guilty of the murders of the women but did not convict on behalf of the Ventura Jane Doe’s unborn son. Samples of Ventura Jane Doe and her fetus have completed DNA extraction and sequencing. Starting with the mother, atDNA data has been transferred to bioinformatics in order to prepare the sequencing data for upload to GEDmatch. Genetic searching will commence when that step is completed.